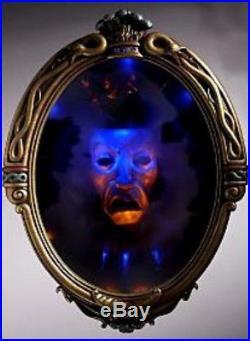 Evil Queen Magic Mirror. From Walt Disney Collectibles. 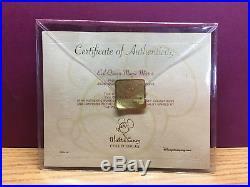 With Certificate of Authenticity & Original Instruction Sheet. Two Way Full Size Magic Mirror. 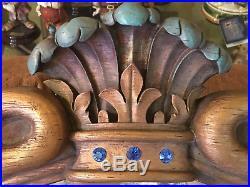 Replica of Evil Queen Mirror on the Wall as seen in the animated movie. Snow White And The Seven Dwarfs. Approximately 10-15 years ago. This is New- it has never been displayed or hung on wall. Measures 36″ high x 28″ wide x 5½ deep. Require 3AA batteries (not included). Looks like wood but is made of sculpted hand painted resin with embedded crystals. 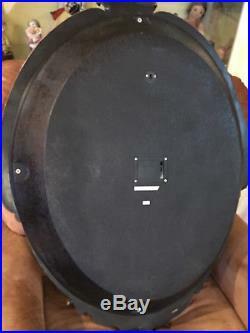 Slave appears in smokey two way mirror when lights are dim or off (see instructions to operate). 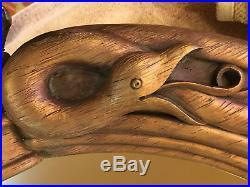 Includes Original Certificate of Authenticity & Original Operating instructions. WHAT IS WRITTEN ON COA & INSTRUCTIONSHEET. COA DESCRIPTION (Also see photo). Evi lQueen Magic Mirror. This is to certify that the. 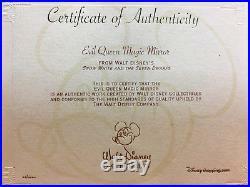 Is an Authentic Work created by Walt Disney Collectibles. And conforms to the High Standards of Quality upheld by. The Walt Disney Company. The story as told on Disney’s Certificate of Authenticity. As animated by Disney Legend Wolfgang Reitherman, the Soporific Slave is devoid of all emotion as his words seal the fate of Princess Snow White. In the 1950s, the Masque’s New Master, Walt Disney, summoned him once again for a much happier duty: to occasional host Disney television productions which reflected upon the Mysteries of Magic. 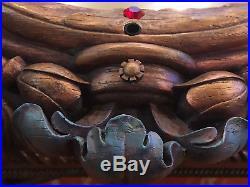 Walt Disney Collectibles proudly invokes the enchantment of the old world as made possible by the technology of the new with this bejeweled Magic Mirror, a decorative wall hanging replicating the memorable motion picture oracle. Peer deeply into the smoky glass – What Wouldst Thou Know? 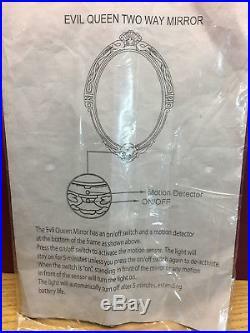 EVIL QUEEN TWO WAY MIRROR OPATING INSTRUCTION SHEET. 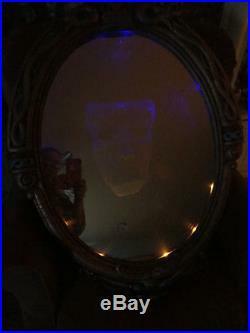 The Evil Queen Mirror has an on/off switch and a motion detector at the bottom of the frame as shown above (see photo). Press the on/off switch to activate the motion sensor. The light will stay on for 5 minutes unless you press the on/off switch again to de-activate. When the switch is on, standing in front of the mirror or any motion in front of the sensor will turn the light on. The light will automatically turn off after 5 minutes, extending battery life. Additional Instructions & Description. Follow included written instructions, but it does not state that when initially turned on only the white lights appear until you wait five minutes for it to turn off and activate it with motion or light and then the purple & white lights appears to expose the Slave behind the two way smokey glass mirror. Dim or turn off lights to see Slave appear. Additional pictures upon request. 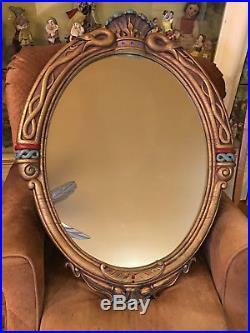 There have been other listings for this same mirror that have used the same enhanced stock photo in order to visibly show the Slave behind the two way mirror when activated. The Slave in mirror is only visible when room is very low or no light and very difficult to photograph. However the slave is visible in real life in a dimly lit or lights off room. ORIGINAL GENERIC BROWN BOX DISCARDED THIS WILL BE PROFESSIONALLY PACKAGED IN A FRESH BOX. EVERYTHING HAS BEEN DESCRIBED ACCURATELY AND TESTED. 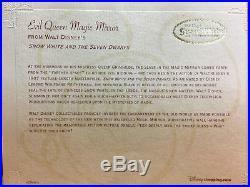 The item “DISNEY EVIL QUEEN MAGIC MIRROR / SNOW WHITE 2 WAY MIRROR With SLAVE 36X28 COA-NEW” is in sale since Wednesday, March 07, 2018. This item is in the category “Collectibles\Disneyana\Contemporary (1968-Now)\Figurines\Snow White”. The seller is “angelsmom1202″ and is located in Aurora, Illinois. This item can be shipped to United States. 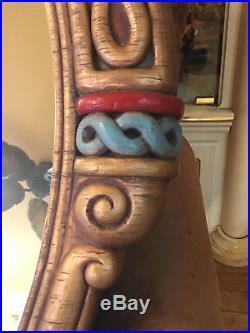 This entry was posted in disney and tagged 36x28, coa-new, disney, evil, magic, mirror, queen, slave, snow, white. Bookmark the permalink.